As a client you want a skilled photographer who will capture your wedding and reception in a photographic story. A photographer with the proper equipment and backup equipment to handle any emergency. I capture the story as it happens the way it happens. This is why you will find I prefer not to use time limits. To capture the real story and provide each bridal couple a wonderful photographic record to be treasured a life time. Below are some packages & products designed to help you in selecting what you want from me, your photographer. All packages can be modified and adjusted to fit your specific needs. You only need to ask. 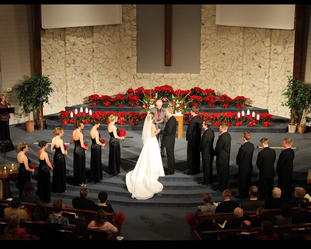 All the packages below will provide proper coverage of wedding and receptions, prints, photo CD/DVD, albums and the ability to mix and match options to fit their needs. Great for the micro weddings and those not having a reception here or at all. Package 1: The Beginnings package: In today's economy budgets are tight, so I have design this package to fill all the basic needs of the bride to have professional coverage of her wedding without breaking the bank. This package there will be 600 to 700 photo files. 1. Engagement Session with an 8x10 print & a newspaper copy for announcement. 2. 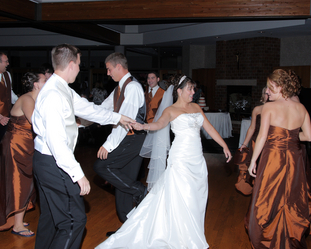 A non-restrictive photo coverage of the wedding & reception. Package 2: A Basic package: This package has all the basics to what many brides want. It includes professional finished prints. This package usually results in 700 to 800 photo files. 1. Engagement Session with an 8x10 & a newspaper copy for announcement. 2. A No Time Limit photo coverage of the wedding & reception. 9. Wall portrait 11x14 gallery print mounted ready for framing. 10. Mothers prints (2) 8x10 Each mother chooses the pose for their print. 10. Wall portrait 16x20 gallery print mounted ready for framing. 11. Mothers prints (2) 8x10 Each mother chooses the pose for their print. Package 5: A Royal package: This package is all inclusive and usually results in 1,200 plus photo files. 11. Wall portrait 16x20 canvas print mounted ready for framing. 13. Mothers prints (2) 11x14 Each mother chooses the pose for their print. The below listed albums are preferred, but there is a large variety of quality albums wholesalers in which I use to match the desires of the bridal couple's album. Zookbinder, Pacific, Flashpoint, Kingston, Pictobooks, Tap and many more are available to create your album. 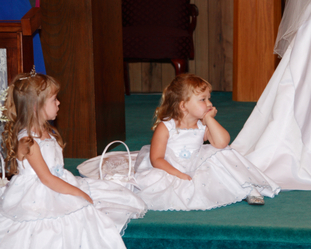 The proofing album to the right has returned to popularity with many brides. This album holds up to 200 4x5 or 4x6 of the best poses from your wedding. You will still receive your photo CD/DVD with all your wedding photos but this book is an excellent option that is available with all our packages. The photo gift box. The beautiful container filled with loose prints of your weddings best poses. A wonderful way to store your photos in a compact keepsake container. In the digital flush mount and pressbook album the phots can not be removed. The photos in this photo gift box are prints that you can remove, put in frames or use for scrapbooking. Can be selected for both proofing or small finished prints. 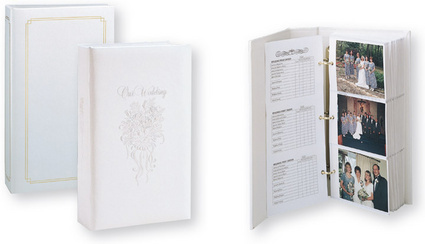 Wedding Albums: There are such a variety of albums available it difficult to represent them all. I have chosen some of the most popular high quality brands in which this studio uses. The descriptions below should help you choose the type and styles you may want in your packages. The Magazine Booklet: It is a soft cover booklet printed with high quality 6 color HD photo ink. The pages are UV coated for long life and durability. Like all digital photo processing montages and layered photos can be designed on each page. The minimum number of pages is 20 and can go up to 70 pages. 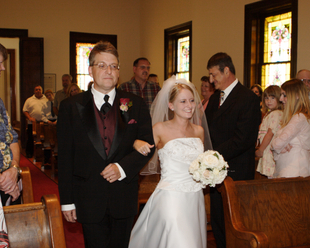 All photos in this book receive our quality inspection and touch up services except index photos. This booklet starts at $120.00; additional pages are $6.00 per page. The Riveli Albums: This is a leather hard cover book. I refer to this album as a press book album for it uses high quality 6 color HD photo ink for the photo pages. The pages are UV coated for long life and durability. The pages are edge to edge photo printing. 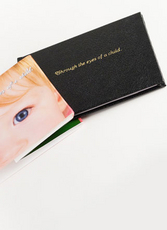 These books are excellent for weddings, baby albums and more. These albums start at 20 pages and go up to 60 pages. Though this album is lower in cost it still provides high quality photographic presentation and durability. This album starts at $200.00 and additional pages are $10.00 per page. The Renaissance Album: Renaissance Albums are crafted by hand. There are no large machines nor computer controlled assembly lines in our factory, just generations of artisan craftsmanship. Experience the hours of dedication that it takes to create a single album. Renaissance Albums are crafted by hand using only the finest materials. All books are inspected and re-inspected to ensure they have achieved our definitive standards. The quality of workmanship and materials built into Renaissance Albums allow us to offer a lifetime guarantee against all manufacturing defects. Renaissance offers the matted photo slip in style album in which actual photographs are slipped into the pages and can be removed and replaced. This album has a minimum of 12 leafs (24 pages) and goes up to 27 leafs (54 pages).